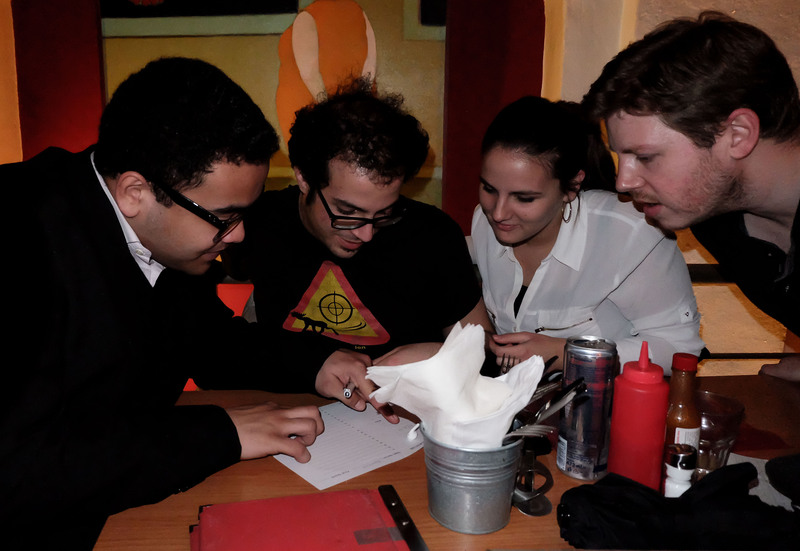 Anglo-American University’s very own “Les Quizerables” quiz team came out on top at the Globe Bookstore and Restaurant this Tuesday, March 8, after beating sixteen other student teams from Charles University, Prague College, UNYP and VSE. A turnout of over 100 students from these universities gathered to battle their wits out against each other. Prague College professor of business and marketing Joel Imhoof, the brainchild of the Pub Quiz Challenge, couldn’t believe his eyes when he saw that people were struggling to move to their tables. “Les Quizerables” team member Aisulu Makhtayeva, AAU business major, said she was proud of her team’s achievements, especially since there were only two teams from AAU participating. “When I heard that we’d won, I screamed. I was so proud of my team and what we had achieved”. The team took home a 500 CZK gift voucher to the Globe Restaurant as well as gift bags for each team member after scooping away 36 points to claim the honours. “The Big Fact Hunt” from Charles University with 35 points came second and the “League of Extraordinary Gentlemen,” also from Charles University, trailed behind in third place with 34 points. Issueminati, AAU quiz team. Photo by Anastasia Kovtunenko. AAU’s second team, “Issueminati,” came in the seventh place after being the only team to answer a tie-breaker question correctly. At the end of the League season which is set to conclude in May 2017, whichever team has won the most quiz events will win a trophy and a cash prize. The second round of this Pub Quiz league is also set to be held at the Globe on the 5th of April. Joel Imhoof mentioned that teams which participated in the first round of the quizzes will be considered before any new teams. Raevenn is a senior contributor to the Lennon Wall and an aspiring investigative journalist. He has worked in the field of journalism for over three years and was a photojournalist for one of two national newspapers in the Fiji Islands that has a readership of 400 000+.